Site map for XiVA musicm8 entertainment server. XiVA musicmate is the home entertainment server that allows you to store and browse music, photos, videos and stream them to your iTunes server, Sonos, LinnDS, Logitech Squeezebox, PS3, Xbox and more. 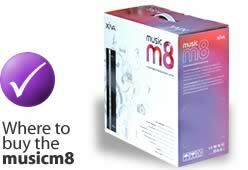 Please use the text links below to find XiVA musicm8 information. Find your nearest stockist from our list of worldwide retailers and ditributors.